Since 1959, the Co-op has earned an international reputation for the exquisite stonecut prints, etchings and carvings of its Inuit artist-members. The Co-op's sales outlet for arts and crafts - located in Toronto - is called Dorset Fine Arts. In addition to the print shop, the Co-op also operates a retail store, property rentals and provides the community with fuel delivery services. Along the northwest shore of Dorset Island, surrounded on one side by rocky hills and on the other, by Hudson Strait, lies Cape Dorset - a community that, since the 1950s, has come to be known as the Inuit art capital of the world. In the distance are the jagged outlines of islands, and the inlets of Baffin Island's southern coast. 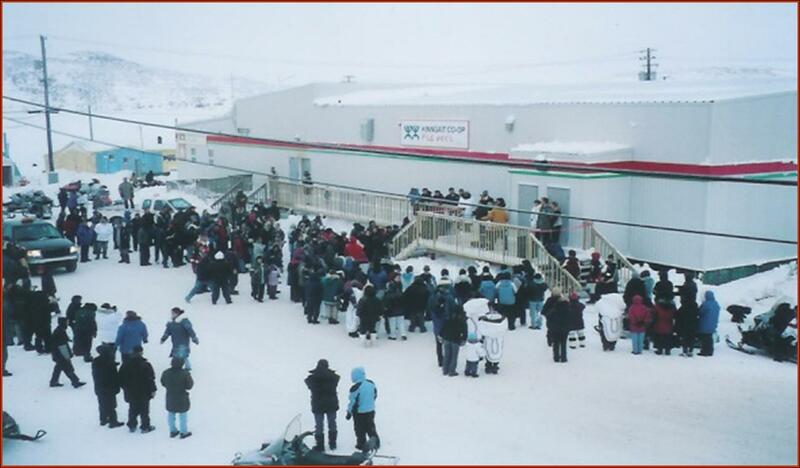 Like most other settlements in Nunavut, Cape Dorset is a modern community, with winding gravel roads, small wooden houses, schools, stores, hotels, a nursing station, government offices and churches. But it is Cape Dorset's outstanding artists and their printmaking and stone-carving shop that have earned the town renown. Each year, art lovers and naturalists flock to Cape Dorset to enjoy the treasures of the West Baffin Eskimo Co-operative and to chat with the acclaimed artists who work here. In 1995, then German Chancellor Helmut Kohl made the visit with Canadian Prime Minister Jean Chrétien. Visitors come, as well, to absorb the rich heritage of local Inuit, and to tour the breathtaking arctic landscape with its abundance of wildlife. The Mallikjuaq Visitors Centre displays artifacts portraying the history of Dorset and Mallikjuaq islands.